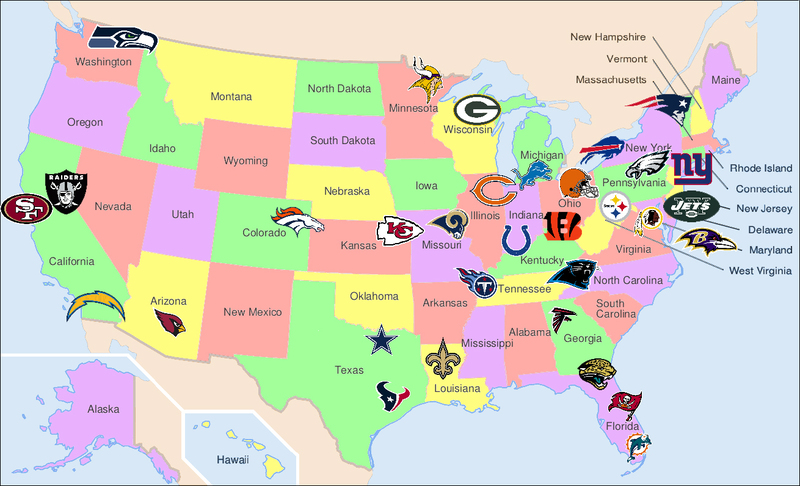 One of my sons made this map the other day (with Photoshop and patience) and said I should put it on my blog as ‘it would help get extra visitors’ since there are hardly any maps of the NFL teams on the web and the few that are to be found are not much good. Having attended an interesting session at Mint Digital the other evening with SEO specialist Will Critchlow of Distilled, it was interesting to see what a strong sense of SEO said son has developed himself just from his usage of the web. With the Superbowl kicking off as I write now seems as good a time as any to publish the gift and try out his experiment. Update 23.i.12: It’s a year on and my son’s team, the New England Patriots, just made it to the Superbowl last night. He’s delighted people have picked up on his map (like Boltbeat) and is currently working on a follow-up for college teams. As a lover of New York, my second favourite city after my native London, I’ll be donning my Giants cap. I starting going on guys weekends to see NFL games this season, this past season we drove from Hamilton Ontario Canada, to Nashville Tennessee to see the Broncos @ Titans game. On the 18 hour trip home we starting discussing next seasons trip, and want to do a 3 in 2 trip. 3 games in 2 days, a 1 o’clock then SNF & MNF, and this map will REALLY help with planning, thank you to your son for making it and you for posting it. Wow, he’s going to be thrilled it’s being put to such practical use! Thanks for letting us know and tell us how you get on. Sure thing man. It is currently pinned up in my room, I have checked some potential games as the NFL has released home/away opponents for each team, but still has not released the schedule. I will definitely keep you posted though. Your map is a fundamental tool in our planning process, thanks again. My son (who made the map) is delighted you’ve found a good use for it. Wow, this is really cool! Good job! GO BEARS!!! Go to an online gift store and springtime in Berlin buy a gift of you’re Kurfurstendamm choice. Skilled agent Internet websites Ost often will advertise by Checkpoint Charlie engraved and personalized touches to create Berlin gifts that are even more secret noteworthy. Create unique springtime gift baskets for dad that suits your dadd Ost personality in this way the presence will definitely catch East his interest. The above posting is clearly code for something. I think that we should all be told! @catalanbrian how’s that – is the message clearer now? do you reckon a rendez-vous is on the cards? Hi Guys, would it be possible to buy a poster size version of this map? What size would you like, Dennis? I’ll get you a price. Glad you like it. What sizes can you offer? Im thinking poster size to put on my wall. Such a good map for someone from the UK and struggles to know the geography of America let alone all the teams. Many thanks! !